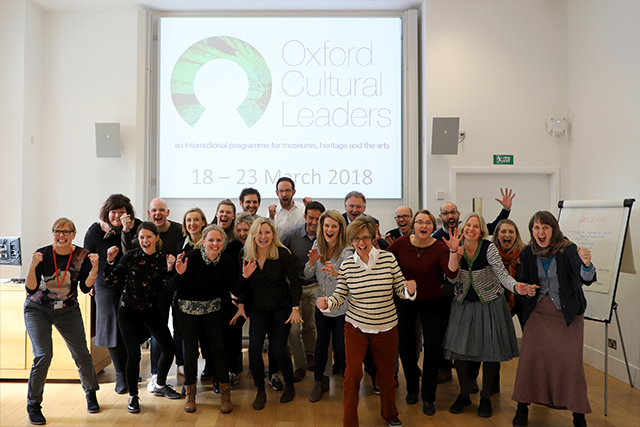 Oxford Cultural Leaders first took place in 2015 and this successful week-long residential programme has run in spring each year ever since. We have welcomed directors, heads of departments, and senior managers from a diverse range of institutions including museums, galleries, science centres, libraries, performing arts institutions, strategic bodies, and media and design agencies, from across the globe including the UK, Europe, the United States, Canada, Australia and New Zealand. We now have an amazing international network of alumni members who meet and connect regularly in order to share ideas and inspiration, support one another’s continued leadership, and develop partnerships and programmes between themselves and their institutions. What has the impact of the programme been on you? Why should you choose Oxford Cultural Leaders over other programmes? Which session had the most impact and why? What have you used from the programme in your work place? Where there any other benefits to attending the programme?